The joy of most deciduous shrubs that we grow in our gardens are the wonderful blooms. The heady scent and colour of Lilac the sweetness of Mock Orange and the bright spring announcement of the yellow Forsythia. Now sometimes our garden planning didn’t allow for the size of these shrubs and eventually they all get old and unruly. 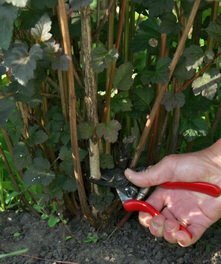 The pruners must be applied but when and how. When To Prune? 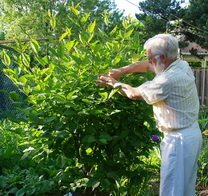 The easy answer to pruning shrubs is to prune any flowering shrub shortly after it has finished flowering. There is a sound biological reason for this. Most of our flowering shrubs spend the time after they flower, developing the flower buds for next year. If we prune them after that has happened then we will prune off all of those nice new flower buds and be very disappointed next year. Even late summer or autumn flowering shrubs, such as Buddleia and most Hydrangea, that bloom on the current years growth can follow this rule. Prune after flowering and next spring the new growth will happen where you want it to and then it will flower. Where To Prune? The bigger question is just where to apply those pruners? The answer depends a great deal on just what we want to accomplish. If we want to create a particular shape, such as a hedge, then simply pruning shrubs within the new growth can produce that shape.As in the top picture. They more common approach is to try and maintain the shrub’s natural shape while controlling its size. Most shrubs consist of multiple stems arising at or near the soil line. The trick to good pruning is to work down at that level. Learn to recognize the oldest branches by their withered, drying bark. Prune out a few of these very old branches near the ground level. If the new branches, shiny smooth bark, are growing from the base of the old branches then prune just above the point that they start from. The object of the exercise is to get rid of some of the big older branches (lower picture,) and allow the younger ones to grow and renew the shrub. This will usually also control the size of the shrub as the older branches will be the tallest / biggest. 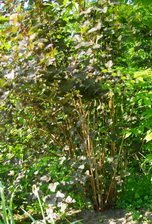 Repeating this process every few years will allow us to have a healthy, actively growing and flowering shrub for many years and it will not outgrow its allotted space.